Chris Catling joined Gloucester in the summer of 1996 and over the following seven seasons he set standards of full-back play which have never since been consistently equalled for the club, although, in recent seasons, Olly Morgan has often shown a similar mixture of attacking flair and defensive impregnability. 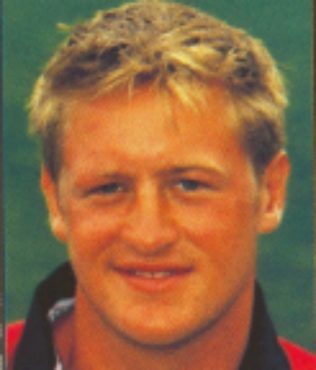 Born on 17th June 1976 and brought up in south London, Catling was educated at the renowned Surrey rugby nursery Whitgift School, and played for England at 18 Group level in 1994 under the captaincy of another future Gloucester player, Phil Greening. He subsequently attended Exeter University and helped the local club to win what was then National Division Four, before signing for Gloucester after the Cherry and Whites had narrowly avoided relegation from Division One. Catling soon established himself at full-back, with his main assets being his finely-judged incursions into the line, his sinuous running and his absolute dependability as a defender. Safe under the high ball and rock solid in the tackle, only his inability to develop a reliable kicking game and the fact that Gloucester were still quite an unfashionable club prevented him from gaining full international honours, although he regularly represented England at A level.